I ask the person from Transport Malta who was obstinate in, again, deciding to place the zebra crossing in its present location at St Julian’s to have a good look at this photograph. By having a close look at the picture, one will notice a car on the left waiting to cross over to the other side. All vehicles behind this car are at a standstill, with a traffic jam sometimes all the way to the Neptunes WPC. This car cannot make a right turn because of the white car, the minivan, and a truck, all waiting for pedestrians to cross. All traffic coming from the Regional Road and Spinola is at a standstill just because a person at Transport Malta lacked foresight. 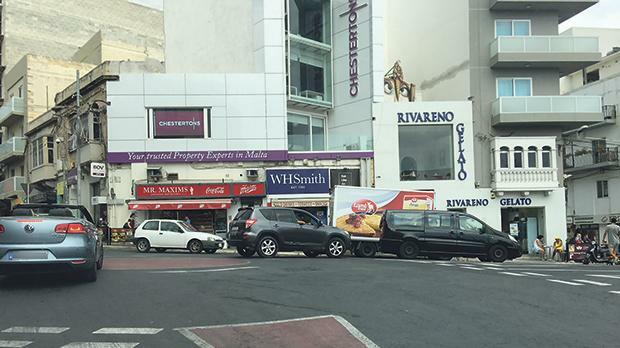 If the zebra crossing were placed further down the road – as was explained to Transport Malta several times – vehicles would simply turn the first corner on the left and there would not be any traffic jam. There are, of course, many establishments in Paceville which are visited by several delivery vans/trucks. They all have to stop before the zebra crossing. The picture also shows how close to the corner the white car is, risking collisions with vehicles coming from behind, as has already happened. Let me be clear. What I am suggesting will not eradicate traffic jams but, at least, the number of such accidents could be contained. When will we be lucky enough to get this point across?